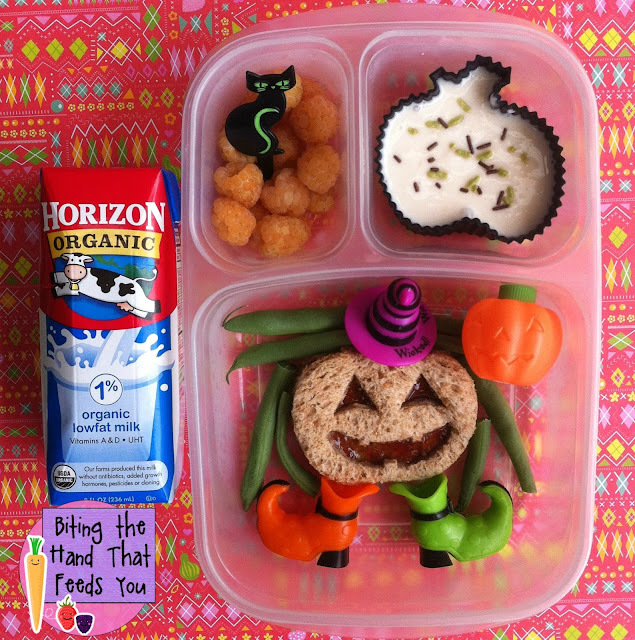 Biting The Hand That Feeds You: Hoppin' Halloween Witch - Blog Hop and Bento Fun! 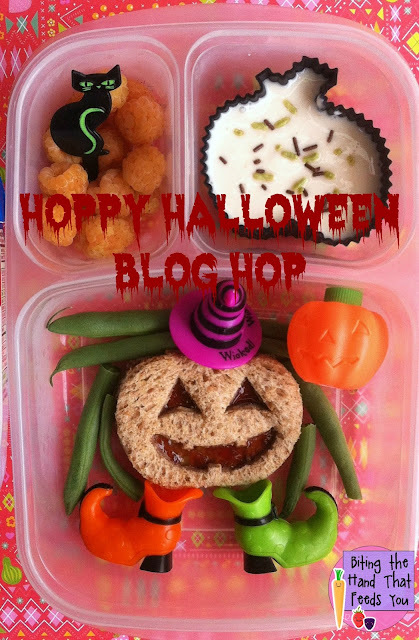 Hoppin' Halloween Witch - Blog Hop and Bento Fun! These Boots Were Made For Hoppin'! Click the pumpkin button to check out the spooOooOooky (and probably mustachio'd) fun from feeling a little lunchy, and keep "hopping" through to the next link, until you've come back around to me! Don't fly off on your broom just yet! Stick around and keep reading for more on my fun lunch! 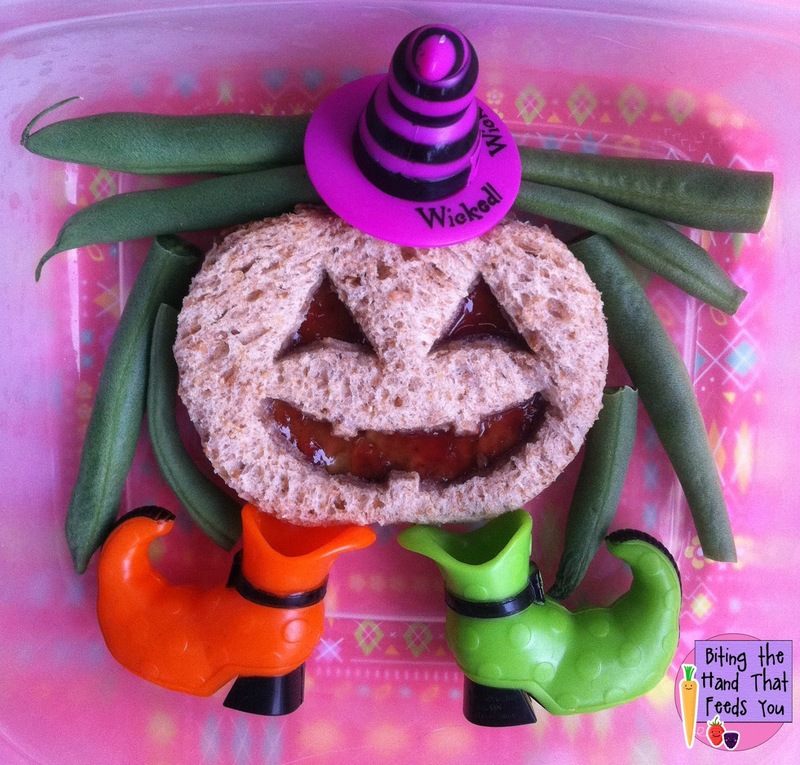 extra sprinkles (in jack-o-lantern container,) green beans, SunButter and jelly sandwich. Mini "Pumpkins": I chose the golden raspberries because they are kind of pumpkin-y looking. And we'd just gotten them from the organic farm stand where we get our CSA box each week. And no witch is complete without her little black cat cupcake pick! Yummy Pumpkin: I put most of a Chobani Champions Orange Vanilla Greek yogurt into a black silicone pumpkin cup, and saved the rest to freeze in a fun ice cube mold of some kind (to be determined later!) I sprinkled on a few all-natural chocolate jimmies and dye-free green jimmies, plus added more into a plastic jack-o-lantern bottle found in a set at Dollar Tree. They initially came with some kind of artificially colored and flavored powder candy, but I dumped it and rinsed them out to use the bottles for more naturally fun stuff! I used a pumpkin cutter to make two bread pumpkins, then used the additional face cut-outs on the top slice only. Cut up some green beans and arranged them into "hair," then added some 3-D witch hat and shoes cupcake toppers to turn a pumpkin into a witch! Bibbity Boppity Boo THAT! Such a fun and healthy lunch! I love your use of golden raspberries! Hee hee -- super cute!! Love your lunch! It's amazing and the witch is super fun! That jack-o-lantern is wicked!!!!!!!! Awesome job! That pumpkin witch is just fabulous!! Love your creativity! That sandwich ROCKS especially with the details! Love your Pumpkin Witch ~ so creative!! You seriously are awesome! I love the witch! Love the little Jack-o-lantern man with boots & hat. Very sassy! Love your sandwich! Super cute! This lunch is so cute! Love how you dressed the jack-o-lantern in witch shoes. Super cute lunch and the witch sammie is super super cute! Super cute! The watermark looks great! What a sweet cheerful witch! The wickedness is just for show. Very cute and great idea to use the golden raspberries as mini pumpkins. Love those boots on the pumpkin! Hahaha too cute!! Love the boots pick! Your pumpkin witch is just faaaaaaaabulous, dahling! I could just hear her cackling away the second I laid eyes on her! Your pumpkin witch sandwich is the cutest thing ever! Love this lunch! I still love those legs ... I need to get some for next year!